Autobiographical memory constitutes an essential part of our personality, giving us the ability to distinguish ourselves as an individual with a past, present and future. This book reveals how the development of a conscious self, an integrated personality and an autobiographical memory are all intertwined, highlighting the parallel development of the brain, memory and personality. autobiographical memory in young children. This book offers a unique approach through combining both neuroscientfic and social scientific viewpoints, and as such will be of great interest to all those wanting to broaden their knowledge of the development and acquisition of memory and the conscious self. Part 1. An Interdisciplinary View of Memory. A New Approach to Viewing Memory. Zones of Convergence Between Different Sciences. Why Other Animals Lack Autobiographical Memory. Part 2. Development of Autobiographical Memory and the Brain. Interdependent Development of Memory and Other Cognitive and Emotional Functions. Part 3. 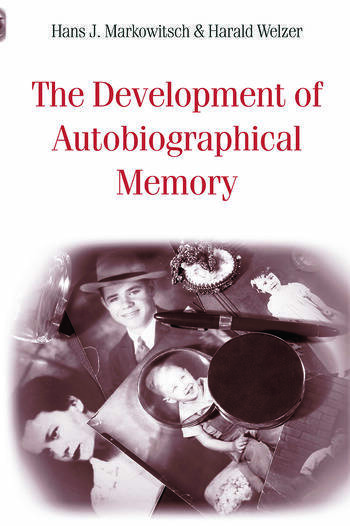 Autobiographical Memory: A Lifelong Developmental Task. Development of Learning and Memory: The Prenatal Period and the First Months of Life. The First Quantum Leap in Memory Development: The Nine Months’ Revolution. The Second Quantum Leap in Memory Development: Language. Exploring Autobiographical Memory in Young Children. Autobiographical Memory: A Continuity in Transformation. The Age at Which Memory Occurs: Results of an Interdisciplinary Research Project on Remembering and Memory. A Formative Theory of Memory Development. Memory at Advanced Ages. Autobiographical Memory: A Biocultural Relay Between the Individual and the Environment. Hans J. Markowitsch is Professor of Physiological Psychology and Director of the Centre for Interdisciplinary Research at Bielefeld University, Germany. Harald Welzer is Director of the Center for Interdisciplinary Memory Research in Essen and Research Professor of Social Psychology at the University of Witten/Herdecke. He also teaches at the University of Hannover and at Emory University Atlanta.